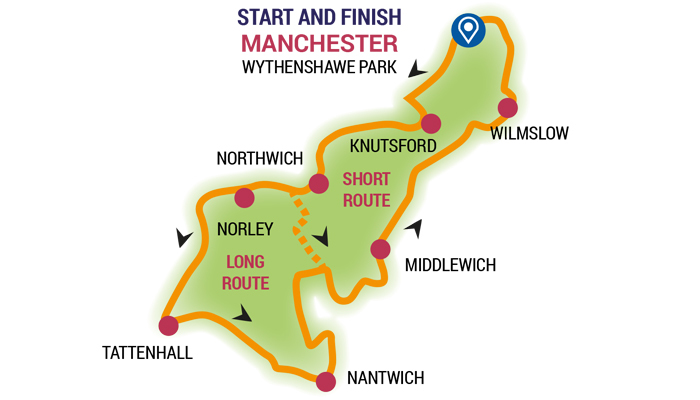 The Christie Manchester 100km will take you through beautiful country lanes that start and finish at Wythenshawe Park and that sweep through the stunning Cheshire landscape. Cyclists will return to a warm welcome by Team Christie where they can enjoy a well-earned massage. Money raised from The Christie Manchester 100km helps to provide inspiration and hope to cancer patients and their families, as well as helping to carry out more research, give more people the very best treatment and care – and save even more lives. 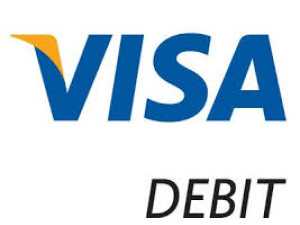 Entry fees only pay for the safe running of the event; The Christie charity needs participants to raise sponsorship to help revolutionise the fight against cancer. 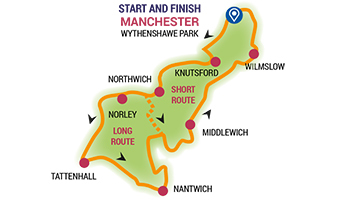 “Organiser Bike Events once again made looking after 3,000 riders seem easy and hoped to improve on last year’s healthy six-figure sum raised for the Christie Hospital.” Cycling Weekly on the Manchester 100 ride. "A group of friends did the Manchester100 in 2012, we've ridden several Sportives this year and we all agreed what a fantastic event this was. From the very start it was well organised, well signposted, a marshal at the junctions letting us know there was a clear road ahead. The feed station/cafes again exceeded expectation, a relaxed atmosphere, well staffed and well organised. And when we came across the finish line to applause, a band playing, and a certificate and gift..absolutely brilliant. Thank you Bike Events, you really know how to do it." A. S.
ELEVATION INFO (TOTAL CLIMB): 1750ft. Minimum rider age is 14 YRS. Riders under 16 MUST wear a cycle helmet and be accompanied by an adult over 18.